The Hydratite treatment is the ultimate and unique combination of two of our best treatments combined together. We first use our HydraFacial MD to improve the condition of the skin and this is then followed by our Endymed RF system to provide skin tightening. The great benefits of the HydraFacial and Endymed combination is that the skin will respond more effectively to radio frequency treatment which in return enhances he tightening effect on the skin. The treatment is safe for all ages and skin types and side effects are very minimal which will involve a little redness and the feeling of heat on the skin for a short time. 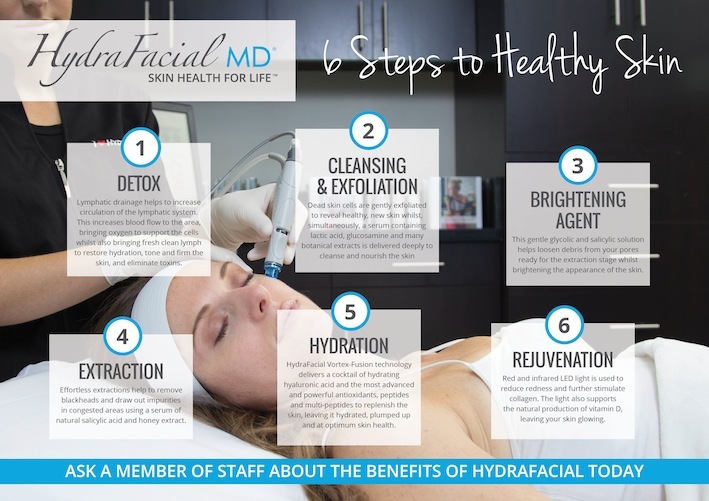 As a stand alone treatment the Hydrafacial is skin health focused on taking impurities out of the skin and then replacing with the good nutrients. Our endymed RF treatment creates a heat in the deeper layers of skin which stimulates collagen production to give a tightening effect. The endymed creates heat so as the Hydrafacial is incredibly hydrating the skin tightening is much more effective when combined with the Hydrafacial. 1. Your treatment will start with a full cleanse to the skin which is then followed by a relaxing Lymphatic drainage technique which will stimulate the Lymph flow, remove your toxins. 2. The second part of the treatment is the exfoliating and deep cleansing of the skin using the patented Vortex cleaning process of the Hydrafacial. This will deliver botanical cleansers and glucosamine deep into the skin. The next stage is to administer via the hydrafacial a light glycolic brightening solution that is infused into the skin to stimulate collagen and soften any blockages in pores before they are extracted purging them of any dirt. 3.We will then commence with our Endymed radio frequency machine to the face. As we have removed the top dead layer of the skin the radio frequency penetrates more effectively into the skin. With the hydrated skin your collagen is able to tighten and stimulate better and a lifting technique will occur. 4.Following the Radio Frequency treatment we will treat the skin again with the Hydrafacial administering a cocktail blend of anti-oxidants and peptides. This part of the treatment will deeply hydrate the skin and then you are ready to experience our Dermalux LED phototherapy. We will use Red and info red lights to stimulate further production of collagen. Fabulous looking clinic with service to match! 3 monthly HydraFacial™ and 3 Radiofrequency treatments. 12 monthly HydraFacial™ and 9 Radiofrequency treatments.